All grade requirements are for the grades students will be entering in the Fall of 2018. Before (8:30-9:00AM) and After (3:00-5:00PM) care is available for all sessions. This session will help students design, build, and program LEGO Robots using the engineering design process. Throughout the week, students will be challenged with several open-ended design activities. 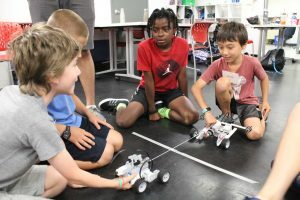 The week will start with activities focusing on stability in design and move to other topics, such as gearing, weight distribution, and momentum, as the students incorporate programming and motors into their designs. This session will help students design, build, and program LEGO Robots using the engineering design process. Throughout the week, students will be challenged with several open-ended design activities. Projects will include robotic snowplows, carnival rides, puppet shows, and many more! 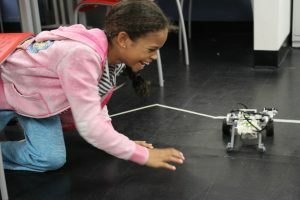 This workshop will explore different types of engineering as students design solutions for problems that their favorite Pixar characters face. 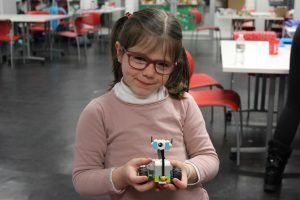 From building a LEGO robotic companion for Wall-E to designing musical instruments for Miguel in Coco, we’ll explore the Pixar universe and engage in all sorts of engineering design! 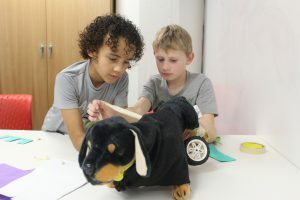 This workshop is perfect for animal lovers! We’ll learn about all sorts of animal throughout the week, and solve engineering design problems to help zoos, pets, ocean wildlife, and dinosaurs. We’ll end the week by combining our knowledge of animal adaptations and defense mechanisms to design our own animals. 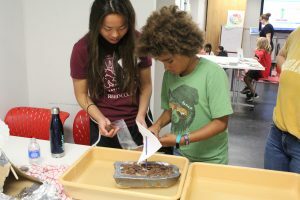 In this week-long workshop, students will explore game design of board games, arcade games, and computer games. 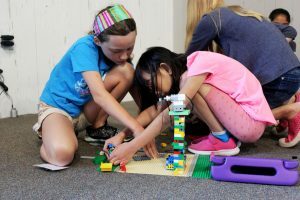 Students will learn about the engineering design process through play-testing and iterative design using craft materials, LEGO, and Scratch coding. The week will consist of open-ended mini-challenges using different materials and new technologies culminating in a larger user-centered design project. Students will explore the topics of digital fabrication and makerspaces, LEGO robotics, space travel, and user-centered design. The focus will be engineering, but special attention will be paid to the client and understanding problems to better address problems in design solutions. Join us as we explore engineering through problem solving, original design creation, and hands-on building projects. 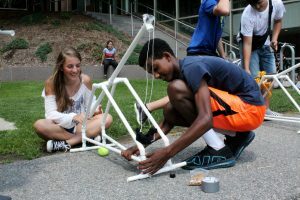 Students will be challenged to develop an "engineering mindset" featuring critical thinking, teamwork, persistence, and the ability to create innovative solutions to complex challenges. 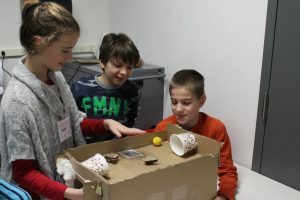 Students have the opportunity to develop practical skills in a variety of topics including: electronics, programming and app development with MicroBits and Thunkable; creative problem solving and design with Rube Goldberg machines built from scratch; and a fusion of art and function with personalized wearable technology. This secret mission workshop will train your students to be both spies and engineers. 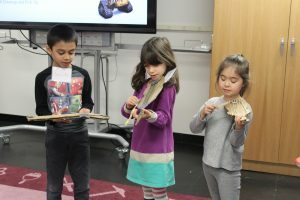 We’ll design gadgets like flashlights, periscopes, and centrifuges; learn about the science behind genetics to narrow down suspects; and explore robotics, circuits, engineering design, and forensics as we build up our spy tool belts, and begin a mission! This session will explore engineering design with a side of sea shanties, as we embark on our own pirate adventure. We’ll begin the week by designing boats to help us traverse the seas. We'll make prosthetics (peglegs, hook hands, and eye patches, anyone?) to help pirates complete everyday tasks. We'll also create life vests and other tools to help us on a treasure hunt! If you are unable to afford these offerings, the CEEO does offer a few limited financial aid discounts to those who qualify. Aid will be prioritized, but not guaranteed, for students who qualify for free/reduces lunch. You must upload a copy of your tax form or proof of free/reduced lunch in order to be considered. Financial aid will be offered on a rolling basis.